True North Flag Football Camp in Toronto is a non-contact day camp for girls and boys of all skill levels, ages 7 to 14 years old. Operating Monday to Friday from 9:00 a.m. to 3:30 p.m. at Memorial Park, campers will be introduced to the game of football in a fun, safe and non-contact environment. Throughout the week, campers will be taught the fundamentals of throwing, receiving, rushing, and defense, as they rotate between quarterback, running back and wide receiver stations. From the skills combine to the draft, we make campers feel like they’re in the pros! 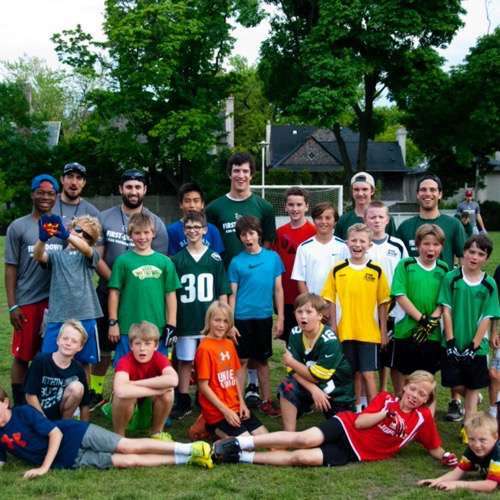 True North Flag Football Camp was originally launched by the founders of True North Sports Camps in 2015 as First Down Flag Football Camp. We've had four incredible summers of football and are looking forward to a fifth in 2019! Your first registration at Flag Football Camp will cost $360. We offer Multi-Sibling and Multi-Week discounts. Any additional weeks of camp (whether for the same child or a sibling) will be discounted by $60/week. These discounts will automatically be applied between different sports camps (ie. Baseball, Flag Football, Multi-Sport, Soccer and Basketball). Please note that this camp operates on the Canada Day and Civic Day holidays (Weeks 1 and 6). If you will be attending for only 4 days either week, you can use the "CanadaDay19" or "CivicHoliday19" discount code to receive 10% off your registration. Drop your child off as early as 8AM and pick-up between 4PM - 5PM for an additional $75/week per child. We operate an optional depot bus service if you need help with pick up and/or drop off at the rate of $75 per week per child. Discounts are available if you need both bus service and extended care. Please see Transportation for more information. Please click here for information about our cancellation policy and payment options. In case it rains, we have access to the North Prep School gym, located at the North end of Memorial Park. We are able to use the gym for physical activity and flag football instruction. If it is raining in the morning or afternoon, drop off and pick up will take place at the gym entrance (which is at the far west end of the school). We operate optional depot bus service if you need help with pick up and/or drop off. Please see Transportation for more information. At the end of each week, players will receive a True North Flag Football Camp Scouting Report. The Scouting Report is a great way for each camper to receive personalized feedback on their progress throughout the week. 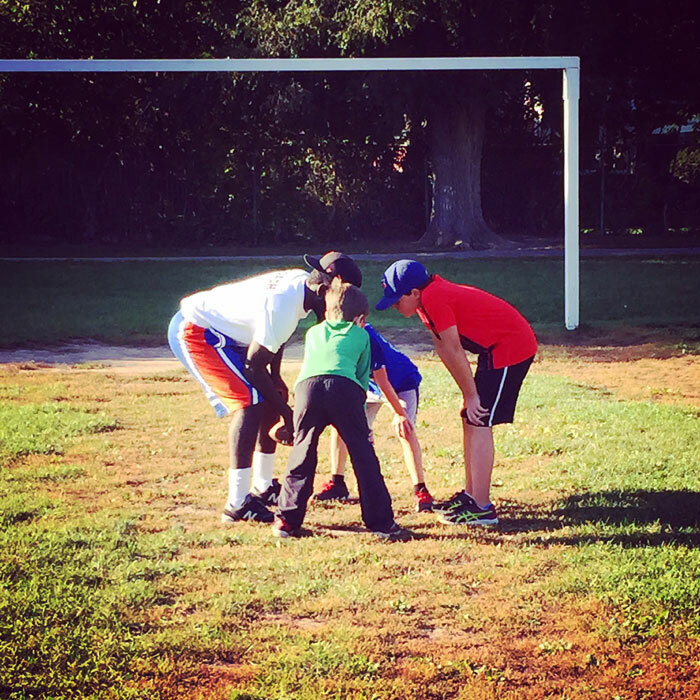 Each week, campers will receive expert flag football instruction in an environment that emphasizes fun and safety. By providing campers a structured method for learning new skills, we try to build each camper’s confidence as they watch themselves improve. We then allow campers to practice those new football skills in a series of fun games and activities. We believe this philosophy is critical at a sports camp and is part of how we aim to deliver the best possible experience for each camper. Lunch/Snacks: All campers must bring their own lunch and snacks. Please note we are a nut-free camp. Football cleats are allowed but not necessary. Running shoes are recommended. Any personal equipment you wish to bring (footballs, receiving gloves etc.) – remember to label everything! Note: All footballs, flags, jerseys, and other equipment will be provided. Each week of camp is designed as a mini training camp that leads up to Game Day Friday. 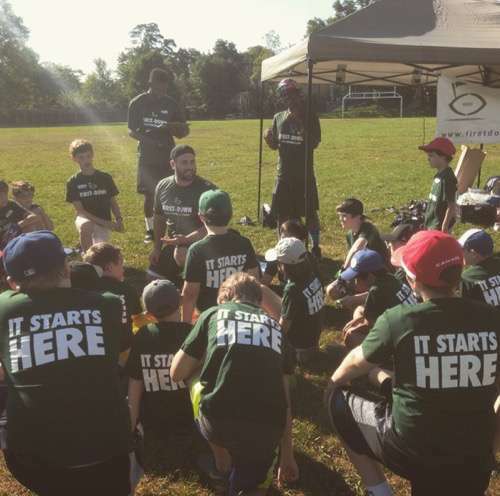 Every camper will have an opportunity to explore the four cornerstones of flag football: quarterback, running back, wide receiver and defense. Each morning will be spent on drills, activities and skill-building, while the afternoons will focus on the application of those skills. The week of camp begins with an initial evaluation of each camper's skill level as they are taught the fundamentals! Campers will participate in a series of drills to provide a benchmark for each of the key flag football skills (throwing, receiving, speed and fundamental movements). An initial Scouting Report is completed for each camper and they will be re-assessed at the end of the week to show their improvement and track their progress. Campers will then be divided into groups and will rotate through different activities that allow them to experience playing quarterback, running back, wide receiver and defense. After lunch is a short whiteboard session, where campers will learn about various technical aspects of the game such as route trees, defensive coverage, and basic plays. Following the whiteboard session, campers will participate in large-group games and activities including Ultimate Football, Steal the Bacon, and Skeleton Football. 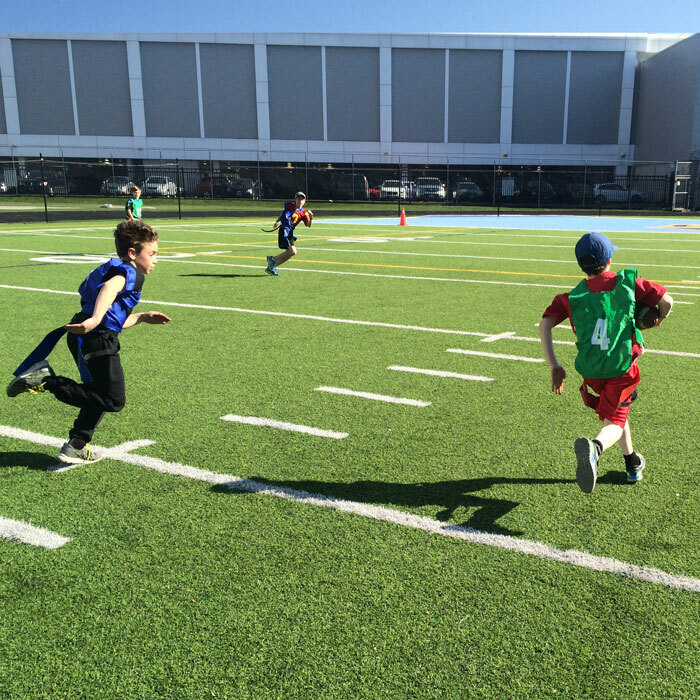 Mornings are spent with campers participating in drills and activities that encourage skill-building in the technical aspects of flag football, while the afternoons focus on fun and creative applications of these skills. The end of the day on Wednesday is Draft Day, where campers are broken up into their respective teams based on their two positional preferences (QB, Receiver, and/or Running Back). Campers are also given their coach's Playbook so they can learn their plays for Thursday and Friday. Campers will spend the morning completing skill drills with their team, as well as learning their coach's Playbook and doing run-throughs of the offense and defense. In the afternoon, a "practice tournament" will feature short, scrimmage-style games between each of the teams. Following the morning warm-ups and introductions, teams compete in a full-day of fun games and a round-robin tournament. A championship game is played at the end of the day and an End-of-Week Scouting Report is provided to each camper. Not sure what program is right for you? Feel free to email us or call our office at (416) 619-1224 and we would be happy to further discuss our programs.